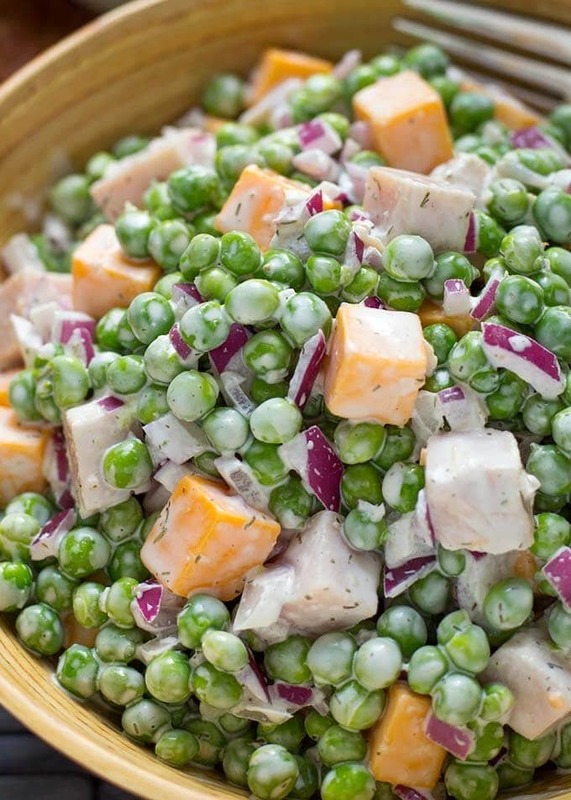 Pea Salad with Smoked Turkey is a tasty side or main dish salad. 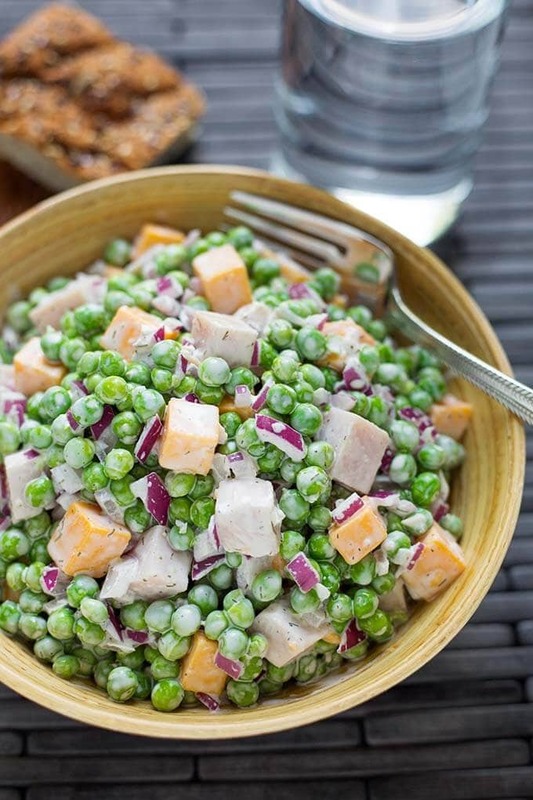 This pea salad is also good with bacon or ham. Simple and flavorful! Last year I made this salad from my youth that I would never eat. When I was young, you could not get me to eat peas, let alone pea salad! My how the times have changed! My siblings and I were members of the “Clean Plate Club” during our childhood. Mom made us sit at the table until we ate everything on our plate. Sadly we didn’t have a dog to feed covertly under the dining room table. Peas were just one of the dreaded vegetables that mom had the nerve to serve me. WHY?! I just couldn’t eat them. I laugh when I think back to how picky us kids were. Maybe our palates really do change over time. 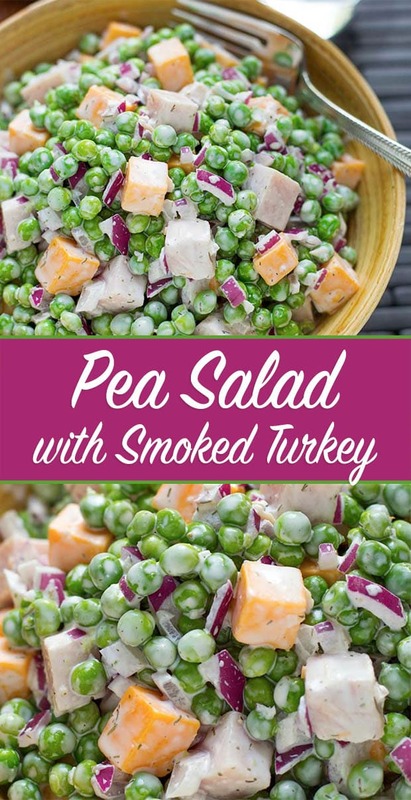 I’m not sure, but I do like peas now, and this Pea Salad with Smoked Turkey is wonderful, and one of my favorite things to eat in the summer. It’s a simple salad to prepare, and the dressing is creamy and nice, with a hint of dill. Switch out the smoked turkey for bacon or ham if you prefer, and enjoy! This is a great picnic salad. 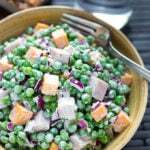 Pea Salad with Smoked Turkey is a tasty side or main dish salad. You can also use either bacon or ham. Simply delicious! Put peas in a bowl and add the turkey, cheese, and onion. In a small bowl combine the mayonnaise, sour cream, and the seasonings. Stir well to combine. Pour dressing over the salad and mix until all of the salad is coated. Cover the bowl and put the salad in the fridge to develop flavors for 30 minutes before serving. *You can use cubed ham or cooked bacon in place of the smoked turkey. We really liked this pea salad! I made it for our picnic and used bacon. It was hard to stop eating it! Great salad! Hi Janice! This is a great picnic salad, and I’m glad it was a success at your picnic! And bacon is so good in it! Thank you for your review!